Lt. 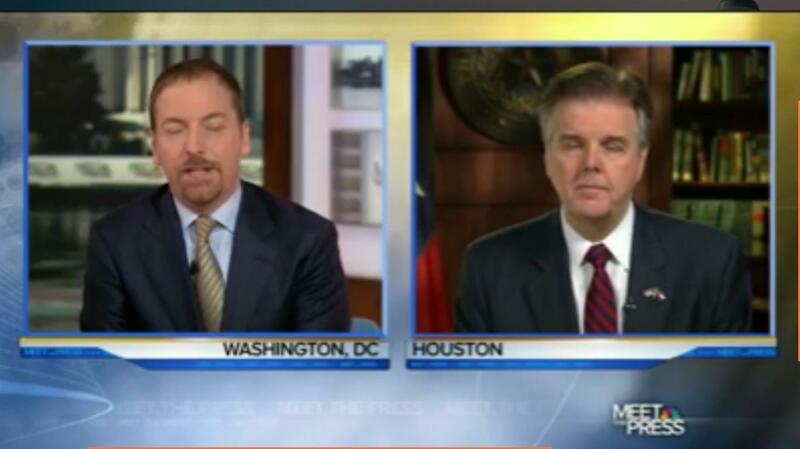 Governor Dan Patrick appeared on Meet the Press Sunday, 3 January, 2016. He performed extremely well as a positive supporter of the Second Amendment, in spite of host Chuck Todd's antipathy toward the Constitutional right. The video is well worth watching if you have the bandwidth to do so. Lt. Governor Patrick explained how people in urban areas, particularly women and minorities, are obtaining carry permits in larger and larger numbers. He refused to fall for the false hypotheticals of the disarmists when Chuck Todd said that open carry was asking for public chaos. Patrick correctly stated 45 states have it, and they have not had public chaos as a result. He said that just because some people fear and hate guns is no reason to stop those of us who love guns and the Second Amendment, from exercising are rights. Patrick is applying the same effective tactic that Donald Trump, Ted Cruz, and others are. Do not accept the assumptions of the media cartel. Call them on their agenda and tell the truth. Lt. Governor Patrick affirmed that Texas is the largest state to have open carry. He also said that where people have have open carry rights, crime is down. Germany: What is available for Self Defense?